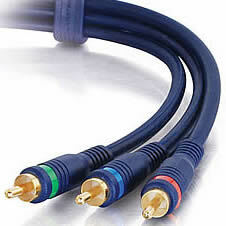 There are 3 Styles of Component Video Cables on this Page ranging in price. The differences can be found in the shielding, gold or nickel connectors, etc. 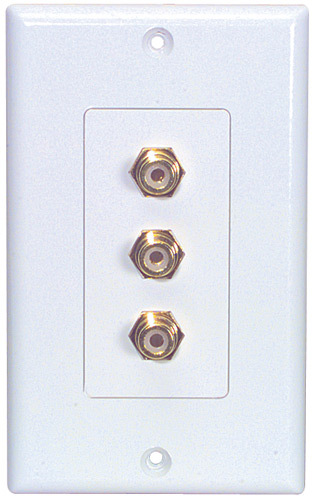 SplitLok™ corrosion-resistant, 24K gold-plated connectors feature the use of precision-machined surfaces and a split centerpin for a solid, dependable electrical contact. Precise soldering techniques using expensive silver solder create increased electrical integrity, maximum signal transfer, long term reliability, and guarantee performance under the most demanding conditions. The Flexcable™ ultra-flexible PVC jacket enables easy installation, and resists binding and kinking which can cause errors in the signal path. Don't compromise your high-definition or extended definition signal; SonicWave component cable is the right choice when performance matters! 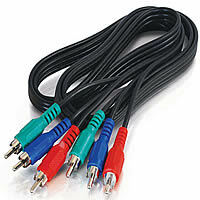 Provides video signal transfer between DVD player and television or projector. Choose Value Series and make the right choice to connect the component video signal from your DVD player to your TV or projector. This low cost cable is quality-made to deliver a crisp, clear video for less. 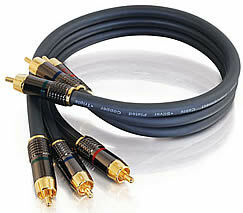 The cable's shielding helps reduce unwanted noise and distortion. Nickel terminals ensure long-lasting, corrosion-free connections while the PVC jacket adds flexibility and durability. The fully molded connectors are color-coded red/green/blue for easy installation and identification, and provide excellent strain relief.